The sequel to the critically acclaimed The Real McCoys! When a baffling mystery strikes Tiddlywhump Elementary, sibling detectives and absolute opposites Moxie and Milton McCoy are on the case. She's the doer. He's the thinker. She's the heart. He's her heartburn. Moxie's friend Emily has received a suspicious letter signed with nothing but a sinister purple squiggle. Then more letters arrive—along with more questions. Who sent them? What do they mean? Is the world on the brink of collapse? Milton and Moxie are the perfect problem-solving team...if only they could get along.When their partnership falls apart, Moxie races to identify the mysterious Squiggler first—while learning the hard way that two McCoys really are better than one. 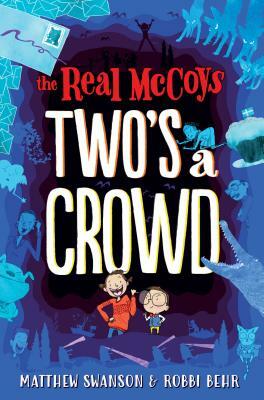 With energetic illustrations on every page, Matthew Swanson and Robbi Behr's Two's a Crowd is a vivaciously funny and irresistibly heartfelt mystery for young readers. Author/illustrator, husband/wife duo Matthew Swanson and Robbi Behr spend all day, every day, making stuff together, including their debut trade picture book Babies Ruin Everything, picture book Everywhere, Wonder (February 2017), and the middle grade series The Real McCoys (fall 2017). In addition to speaking and teaching on collaboration and creative entrepreneurship, raising three small children, and fishing commercially for sockeye salmon on the Alaskan tundra each summer, Matthew and Robbi run Bobbledy Books (an indie press offering picture books and music for kids) from the hayloft of their home/barn/studio on the Eastern Shore of Maryland. Author/illustrator, husband/wife duo Matthew Swanson and Robbi Behr spend all day, every day, making stuff together, including their debut trade picture book Babies Ruin Everything, picture book Everywhere, Wonder (February 2017), and middle grades series The Real McCoys (fall 2017). In addition to speaking and teaching on collaboration and creative entrepreneurship, raising three small children, and fishing commercially for sockeye salmon on the Alaskan tundra each summer, Matthew and Robbi run Bobbledy Books (an indie press offering picture books and music for kids) from the hayloft of their home/barn/studio on the Eastern Shore of Maryland. "A tribute to the power of imagination awaiting those who are open to the marvels that surround them." —School Library Journal"